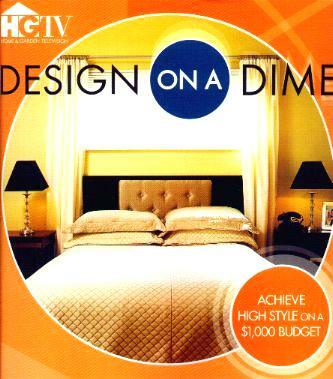 I have never seen the television program HGTV Design on a Dime series, but I do love make-over shows. Unfortunately for me, I am severely challenged when it comes to decorating, and trying to work from a book is even harder. I try to look for suitable ideas I could possibly use and sometimes there are workable ideas, but not in this book, for me, that is. I did like the transformation on pages 26/27 which I could envisage doing. I also liked the idea of covering seats on page 79, the Embellished Chandelier on page 83, and the little office on page 116. The rest I didn't think much of to rave about. This book is probably very helpful to those who live in small spaces, as most of the illustrations indicate a tight squeeze - I'd feel claustrophobic with all the clutter. If your place was any larger, however, you'd not be decorating on a dime I guess. I wish they'd take "aerial" photographs because I just can't seem to "see" it from the angles they present. Page 58 is almost there. Is it just me? Great for those who are handy around the house and have style and vision. If not, get a decorator. Lastly, are they serious about those green kitchen cabinets? Conclusion - Useful for someone living in a pokey little place that needs refreshing or livening up.